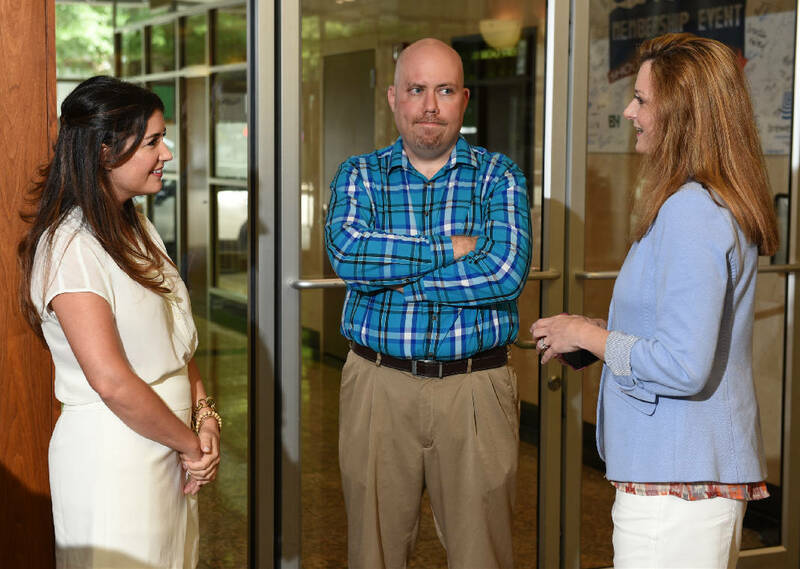 Ashley McCue, left, director of market development and recruiting at MomSource Network, and Carlene Carrabino Vital, right, director of market development at MomSource, talk with Jeremy Henderson, designer at the Chattanooga Area Chamber of Commerce, at the Chamber offices on Tuesday, July 21, 2015, in Chattanooga, Tenn.
For two months, Ken Morris was on the hunt to hire a part-time bookkeeper for the businesses he and his brother, Kurt, own. They were pretty picky about what they wanted: someone who could handle technical aspects of the job, obviously, but also was easygoing, who'd fit in with the lighthearted vibe that the 10-person office carries. "We're a fairly small team, so I need everybody to mesh," said Morris, whose offices are in Chattanooga. "I like for my people to have fun. I didn't want somebody who was real uptight or rigid." He scouted in typical ways: reaching out to friends, running ads on monster.com, probing colleagues for leads. He even felt hopeful doing a few phone interviews, but no one was quite the right fit. MomSource Network came up as a recruiting option the way it typically does: word of mouth. Morris' banker told him about the company, which describes itself as an organization that advocates for flexible employment, from remote to part-time to variants of full-time. It connects employers and workers not just mothers in order to fill jobs with all sorts of work schedules. Why do people want flexible work schedules? Once Morris had signed up with MomSource, the company's Chattanooga development director, Carlene Vital, called to get the skinny on what he wanted, asking detailed questions about work environment and the personalities already in play at the company, he recalled. "I got one lead, and she was perfect," Morris said, adding that Vital had a second candidate to offer, but he never needed to contact that one. MomSource reports it has placed about 180 candidates and has only a 2 percent turnover rate. The Knoxville-based company, which opened a Nashville location in June, set up shop in Chattanooga in January. The company plans to eventually expand beyond Tennessee. Knoxville native Courtney Jones launched MomSource in 2013, after doing on her own and without financial gain what her company essentially accomplishes now. In 2012, she connected a neighbor with an accounting background with a company she knew had been outsourcing its accounting work. Next, Jones introduced an acquaintance she bumped into at a child's birthday party with a husband-wife broker team she knew. Her goodwill help land both those women jobs. "It was me doing what I thought I could do to help," Jones said. Then people started asking her for help, saying they'd heard she got so-and-so a job, and, hey, does she know anyone who might be a good match for them? "That's when I started investigating it," said Jones, who herself worked out a flexible work schedule with U.S. Cellular, her employer when she gave birth to her first child, now 5. She also has a 2-year-old. Jones is MomSource's sole owner, but she has a team of eight. Her startup costs were just $5,000, she said, the sum she paid for entity-formation paperwork, registering with the state and attorney fees. MomSource doesn't list any of its jobs, though from time to time it might post some on its Facebook page. Every candidate gets a phone interview with a MomSource recruiter, and in an online application divulges specifics on desired compensation, ideal work environment and the type of job flexibility sought. A resume is required. Detailed candidate information at the outset combined with detailed job information that MomSource recruiters extract from companies that have jobs open ideally leads to excellent matches. "We're trying really hard to tailor it; we're looking for long-term matches," said Vital, who's also president of the Chattanooga Chamber of Commerce's Leadership Chattanooga Alumni Association. She works with about 20 companies in the Chattanooga area, leads she developed and adds to with the enthusiasm of a fresh-faced college graduate. In fact, Vital pursued Jones, convincing her she was the right person to spearhead a Chattanooga location. MomSource gets its income from the companies it helps: 25 percent of a new employee's first six months of pay. MomSource's fees were more conservative initially, starting at 25 percent of the first three months of pay. "People were constantly telling us we were underpriced," Jones said. So she bumped it to four months, then five, then six. The industry standard for full-time placement is 25 percent of a worker's first-year salary. Despite the name, MomSource places non-moms and men too. Still, Moms are its largest constituency, followed by retirees ("They don't want to work four hours a week or be Wal-Mart greeters," Jones said). About 90 percent of its candidates have four-year college degrees or higher. "From the beginning, I never said this was just for moms," said Jones. "But I think that in general that was the group that was most active about asking for help and probably most under-heard as far as having someone advocate for them." There aren't plans to change the name, which initially was MomForce. The 2014 National Study of Employers shows that flexibility for full-time employees over where and when they work is rising. This includes options such as working remotely occasionally, also called telecommuting, which saw an increase to 67 percent in 2014 from 50 percent in 2008 for at least some employees, one of the broad trends in the report compiled by the Families and Work Institute and Society for Human Resources Management. Only 8 percent of companies surveyed allow most or all of their employees to telecommute. The main reason people want flexible jobs is to create more balance in their lives, according to an October 2014 survey of 1,500 job seekers by FlexJobs, an online company based in Colorado that helps workers find flexible jobs. Apparently there can be perks for employers too. Almost a quarter of FlexJobs' respondents said that with a flexible work schedule they would forgo health benefits, and a whopping 82 percent said they'd be more loyal to their employers. Also, a study by a University of Illinois business professor, released last year, showed telecommuting yields positive effects in employee performance, including task-based performance. Emily Graffius spent several years working remotely for a New Mexico nonprofit organization, but wanted to be with a Chattanooga-area nonprofit. For one-and-a-half years she looked for a local gig. Finally, in June the Signal Mountain resident nabbed the director of development title for the Chattanooga Zoo, a part-time position she got through MomSource. Now, the 35-year-old is guiding the zoo's quest raise $10 million, money that will go toward adding giraffes and lions. It's been a good for her 8-year-old son and 5-year-old daughter to see her take on the new job, in that overplayed, but true, "reach-your-dreams" way, she said. "Even as a mom, staying at home is awesome and honorable, but if you want something else, you're life can keep evolving."